Rosalee Johns says she has her life back thanks to a freezing therapy called cryoablation that restored her heartbeat to normal. In 2008, Johns, then age 67, was diagnosed with atrial fibrillation, a condition in which the atria — the upper chambers of the heart — receive irregular electrical impulses that cause erratic heartbeats. Johns’ heart beat rapidly. She was light-headed and short of breath. The episodes occurred every three or four weeks, lasting 12 to 15 hours. Despite treatment with medication, the episodes increased to almost daily. 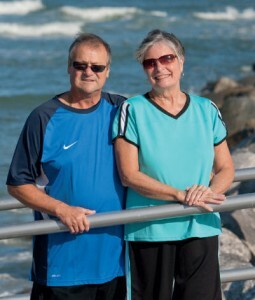 Increasingly debilitated, Johns asked her local cardiologist about other treatments. He pointed her to Mayo Clinic. Fred Kusumoto, M.D., a cardiologist who specializes in electrophysiology at Mayo Clinic in Jacksonville, Fla., discussed her options, including cryoablation, a new therapy where tiny circles of heart tissue are frozen, blocking the abnormal electrical activity in the heart and restoring normal rhythms. The therapy was tested at Mayo Clinic in Rochester, Minn., and in Jacksonville — and at 25 other medical centers around the United States. Cryoablation restored normal heartbeats for 70 percent of the 245 patients in the study, compared to 7.3 percent of patients successfully treated with medication. Mayo Clinic was the first facility to offer the procedure, which the U.S. Food and Drug Administration approvedin 2010. Cryoablation is minimally invasive — no major incisions required. The surgical team threads a flexible plastic tube (catheter) through a vein, starting through a small incision near the groin and advancing to the heart. A tiny balloon is attached to the end of the catheter. Once the balloon is in place, physicians administer very cold liquid into the balloon. The coolant transforms into gas, expands and creates circles of lesions around the inside of the pulmonary vein in the heart. These lesions stop the errant electrical impulses causing the arrhythmia.